17 July 2018, NEW YORK – Natura &Co, the global purpose-driven beauty group, and its ethical beauty brand The Body Shop, are this week advocating for change at the United Nations (UN) High Level Political Forum (HLPF), taking place in New York. Natura &Co, Natura and The Body Shop are hosting and participating in events throughout the week with key UN missions and stakeholders to reinforce their commitment to the Sustainable Development Goals (SDGs) and their drive to build a fairer and more sustainable world. In line with the HLPF theme of "Transformation towards sustainable and resilient societies,” The Body Shop will be enforcing its commitment to Sustainable Development Goal (SDG) Goal 12: responsible consumption and production. 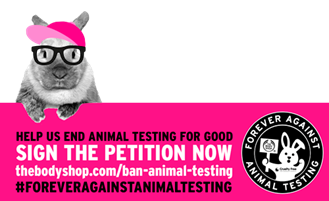 The goal is relevant to The Body Shop and Cruelty Free International’s current Forever Against Animal Testing Campaign, which aims to end animal testing in cosmetics globally. Seven million people around the world have signed the petition which will be presented to the UN later this year. Natura is also fully committed to the 2030 Agenda for Sustainable Development adopted in 2015. Through initiatives relating to issues such as carbon, waste, women’s empowerment, education, water, biodiversity and the Amazon Rainforest, Natura contributes directly or indirectly to 16 of the 17 SDGs. - The Body Shop and Cruelty Free International will host a private breakfast event to lobby missions and dignitaries at the UN of the importance of Goal 12 and its relevance to the joint campaign, by harnessing consumer support to achieve real change. - Roberto Marques, Executive Chairman of Natura &Co, will participate in a panel at the UN HLPF Business Forum discussing “a new era for responsible business”. - Further, last month the United Nations Global Impact announced the appointment of Guilherme Leal, co-chairman of the Board of Directors of Natura &Co, to its Board. The Board plays an important role in shaping the strategy and policy of the initiative, which is the largest corporate sustainability group in the world, aiming to call on companies globally to align their operations and strategies to meet common goals. Roberto Marques, Executive Chairman of Natura &Co, said: “Natura &Co is a global cosmetics group present in 72 countries through three brands: Natura, Aesop and The Body Shop. We value traceability and sustainability in sourcing ingredients, promoting the preservation of biodiversity, fair trade with suppliers, the elimination of animal testing, the neutralization and reduction of carbon emissions, as well as support for education. We’re now working on a common sustainability vision for the three companies, based on what we are already doing and on what we envision for the future”.